The concept of style has multiple layers of meanings, and this week’s Copyblogger Collection contains multiple layers of insights. 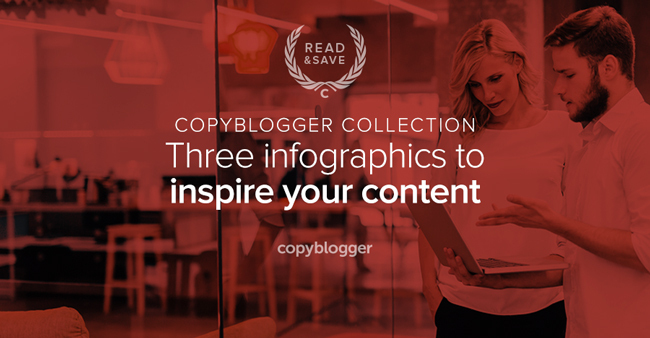 Within these lessons, however, you’ll also discover three different types of infographics. Infographics visually depict your unique perspective and immediately communicate style. As you work your way through the material below, consider how you can attract new readers with intriguing illustrations that complement your written content. If you think silent films are outdated in our current talkative world, think again. Demian Farnworth never misses an opportunity to pay tribute to outstanding storytelling practices. The Amazingly Simple Anatomy of a Meaningful Marketing Story [Infographic] breaks down the elements of stories that get under our skin and stick with us. When you understand these elements, you can use them to craft powerful messages for your audience. The content you produce to tell your marketing story needs to be unparalleled in quality and value. You’ll want to choose your words carefully so you say what you mean. Study Demian’s tips to ensure your content provides complete satisfaction for your readers. Henneke has an enchanting writing style that makes you smile, and she also consistently presents exceptional advice. So you know she cooked up a winner for you in 9 Landing Page Goofs that Make You Lose Business [Infographic]. Check out how she compares landing pages to road trips as she takes you on an adventure that will ultimately help you improve conversions. Use this post (and save it for future reference!) to create stylish content that compels readers to take a closer look. In the spirit of rugged individualism, quench your audience’s thirst with something refreshing.